After growing cells in the presence of low concentrations of antibiotic for five days (either norfloxacin, ampicillin or kanamycin – each representing an antibiotic with a different primary cellular target), they periodically tested samples for their resistance to a range of the same, and different classes, of antibiotics. The aim was to determine whether treatment with one antibiotic could confer cross-resistance resistance to other antibiotics. Whilst antibiotic resistance mechanisms against one drug can often confer resistance to different molecule of the same class, development of resistance to a drug molecule in a different class is less likely, and would be an important finding. The figure (left) produced for the accompanying preview article, by Ben Kaufmann and Deborah Hung 5, summarises the findings. The researchers found that true enough, growth in one of the antibiotics – most notably ampicillin – resulted in cross-resistance to a number of the other antibiotics. In contrast, when grown in the absence of any antibiotics, only spontaneous mutants could be expected when then exposed to high levels of antibiotic. Similar findings were observed with an S. aureus strain and a clinical E. coli strain, so were not just an artefact of laboratory E. coli strains, which can be poor models for in situ clinical infection. Interestingly, in some cases the ampicillin-treated isolates that were resistant to another drug actually remained sensitive to ampicillin, indicating that sub-lethal antibiotic exposure results in a random mutation process, rather than selective. 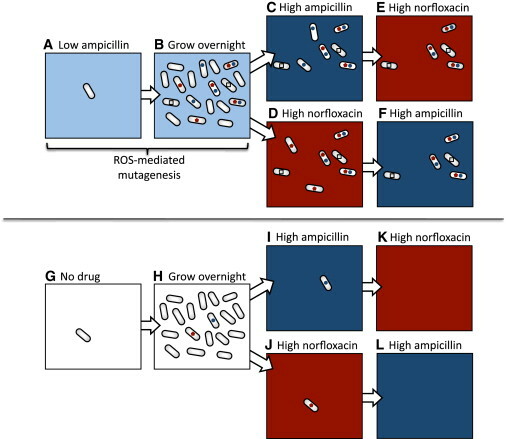 Those cells newly resistant to ampicillin did not revert if grown for several days in the absence of the antibiotic, so represent a stable mutation rather than transient adaptation to growth in the presence of ampicillin. The positions of the mutations conferring cross-resistance were found in the expected genes of drug targets, comparable to those documented in other clinical bacteria, rather than by mutation of a general efflux pump capable of pumping out multiple drugs. However, they did identify one isolate with a mutation in the acrAB gene, a multidrug efflux pump that is linked with ROS-responses, and they propose that the mutation may contribute to multidrug resistance; they haven’t discussed this further in this paper. Of course, the proposition is that the development of such mutants is mediated by the hydroxyl radical causing damage to the cell DNA. If the same experiments were performed in the absence of oxygen, it would be expected that no resistance to antibiotic would be observed, which was indeed the case. Whether or not it is the hydroxyl radical that directly mediates the mutation to the genes encoding the targets of the antibiotics is yet to be unequivocally demonstrated. It may be that DNA damaged by hydroxyl radicals initiates other cellular processes, such as the bacterial SOS response, which is known to repair DNA at the cost of introducing mutations and recombination. In this case, the proposed mechanism may act as perhaps an alternative means of generating the necessary genetic variation needed to dig themselves out of a tight spot. Indeed, in bacterial populations there may also be naturally occurring mutator cells, which can occupy anywhere between 0.5 – 30% of the cell population. These cells are usually defective in DNA repair, and may undergo a 1000-fold increased rate of mutation compared with the background population 7. The broader implications of the study are pertinent as current recommendations for antimicrobial chemotherapy is, ideally, to use cocktail antibiotics to preclude evolution of resistance that can result from monotherapies; though whether or not this is widely practised is another matter. Furthermore, the incubation of these strains in sub-lethal concentrations of antibiotic is relevant in clinical practice where bacteria can commonly experience such sub-lethal drug concentrations. The dosing regime for antibiotics means that the concentration of the drug will periodically drop to a low level for short periods, or longer if there is poor patient compliance with the regime instructions. Furthermore, some areas of the body are poorly supplied with drug, receiving less than the plasma concentrations, e.g. skin, joints and prostate. Such conditions may permit the evolution of cross-resistance as described in this work. There remains a great deal of work to do in this area however. First and foremost, it will be important to determine the clinical relevance of the hydroxyl radical mechanism in situ. One of the drugs the researchers tested, kanamycin, is an aminoglycoside; another study has previously shown that the sub-lethal levels of another aminoglycoside, tobramycin, induces biofilm formation 6. For both Gram-negative and Gram-positive bacteria, subinhibitory antibiotic treatment can stimulate production of exopolysaccharides necessary for biofilm formation – and the significance of biofilms is such that it protects cells from lethal levels of antibiotics, but the low oxygen environment may make hydroxyl radicals less significant. Furthermore, the phase of growth will be important. Does the mechanism suggested work as well on stationary cells as it does on actively growing cells. It is well known that bacteria can become ‘indifferent’ to bactericidal drugs, simply because current drugs are designed to target processes that are active only in growing cells, rather than non-growing cells. This, in fact, will be the subject of my next post. Research on antimicrobials since the 1960’s has focussed on identifying the mechanisms by which bacteria can physically modify a drug’s structure, disrupt the interaction of drug and target, or alter the activity of transport machinery that keeps the drug away from its target. An increased research focus to characterise the downstream physiological responses of bacteria to sub-lethal, as well as lethal, levels of antibiotics may help provide new impetus to inform future drug dsicovery 8. 1. Kohanski et al. (2007) A Common Mechanism of Cellular Death Induced by Bactericidal Antibiotics. Cell 130: 797-810. DOI: 10.1016/j.cell.2007.06.049. 2. Hassett & Imlay (2007) Bactericidal Antibiotics and Oxidative Stress: A Radical Proposal. ACS Chem. Biol. 2: 708–710. DOI: 10.1021/cb700232k. 3. Kohanski et al. (2008) Mistranslation of Membrane Proteins and Two-Component System Activation Trigger Antibiotic-Mediated Cell Death. Cell 135: 679-690. DOI: 10.1016/j.cell.2008.09.038. 5. Kaufmann & Hung (2010) The Fast Track to Multidrug Resistance. Molecular Cell 37: 297-298. DOI: 10.1016/j.molcel.2010.01.027. 6. Hoffman et al. (2005) Aminoglycoside antibiotics induce bacterial biofilm formation. Nature 436: 1171-1175. DOI: 10.1038/nature03912. 7. Chopra et al. (2003). The role of mutators in the emergence of antibiotic-resistant bacteria. Drug Resistance Updates 6: 137-145. DOI: 10.1016/S1368-7646(03)00041-4. 8.Dwyer et al. (2009) Role of reactive oxygen species in antibiotic action and resistance. Current Opinion in Microbiology 12: 482-489. DOI: 10.1016/j.mib.2009.06.018. Thank you so much for covering this! i heard about it at some point last term and got majorly excited about it but never really had time to get through all the relavent literature. Needless to say I *love* this theory, partially because it means that a lot of stuff I thought I knew about antibiotics has just been thrown up in the air, but mostly because it gives even more support to the “antibiotics-as-signalling-molecules” theory, as it shows that it’s not *antibiotics* per say that are dangerous, just stupidly large amounts of them. Wow that was a long sentance 🙂 Great post as always, and good luck in the Researchblogging awards! Fascinating! Did they look for other mutations, besides the ones in the ‘expected’ drug-related genes? Since the mechanism for the increased mutation they propose they propose is aspecific, it would be a really easy thing to check. I’m just asking because looking for mutations in places you expect might open the door for some observational bias ;). Thanks for the comment Lucas. They were only looking for the usual suspects, those genes in which mutation are known to affect resistance, and in this paper they did not scan wider than the selection of specific gene targets they mention. You are correct however that there is the potential for observational bias, especially as the interesting thing would be to look for would be mutations in unexpected places that give rise to resistance, or tolerance. The Collin’s lab has plenty of interest and potential to take a broad systems biology view of such mutation generation, and with the new sequencing technologies available I wouldn’t imagine it is beyond their purview. One thing that I perhaps skipped over in the post was their finding of a mutation in the promoter of the acrAB gene, a multidrug efflux pump, which in their 2007 paper they cited as being ‘regulated by the superoxide-sensitive SoxR system, and it has been suggested that the soxR-regulated genes represent a coordinated response against antibiotics cell death.’ They propose that the mutation, which they found in an ampicillin-treated norfloxacin resistant isolate, may affect binding of the promoter by the AcrA repressor transcription factor and lead to increased activity of the pump; this, they suggest, may contribute to multidrug resistance, although they don’t test this further. Fascinating stuff. I give these things everyday to patients not knowning if I’m doing the right thing. At least we are now being more careful to limit the use of antibiotics in the perioperative course. But we are still using too many I fear in general with the result of inducing more resistance. I’m hoping a better understanding of host/bacteria interactions will help us to more precisely block pathogenic strains and boost innate cellular defense mechanisms. Hi EtherDoc, thanks for reading. I can imagine the difficulty of any patient-facing professional feeling confident in their prescriptions if they follow the incremental advances in scientific development behind the scenes. In some senses it can be useful that there is typically a 7 year lag between a robust scientific finding and action in the clinic, though in some areas of medicine there may be up to a 17 year lag. This at least presents some degree of consistency to the patient, who you might imagine taking things into their own hands if they find their physicians changing tack continually with new scientific evidence. 1. Bacteria can avoid being killed by being in a stationary phase (non-growing or metabolically inactive), often described as ‘indifferent‘, and are thus not subject to the same killing response that a rapidly growing cell would have. 2. They may be ‘tolerant‘, where they have genetically uncoupled the killing activity of the bactericidal drug from inhibitory activity, thus they survive until the pressure is off. 3. In a bacterial population there exists a sub-population of ‘persistor‘, cells that regardless of the growth state of the population as a whole, continue to exist in a stationary or growth-retarded state, and increasingly there are defined genetic loci implicated in persistence, including the stress-response pathways. 4. Finally, and most stubbornly, there is the issue of biofilm, which represents a uniquely difficult issue to address, given the refractory nature of biofilm toward antibiotics. Of course it goes without saying that the scope for evolution of defined antibiotic resistance in cells that survive killing is great, and whilst these surviving cells may not present an issue to a healthy immune system that actually does the job of clearing an infection, in immuno-compromised patients the inability to affect a complete kill by chemotherapy is an issue. Thus there should be an onus on developing drugs that can also, quixotically, target non-growing cells and biofilms. ….though I have a post on this coming up.